Homeowners’ request. 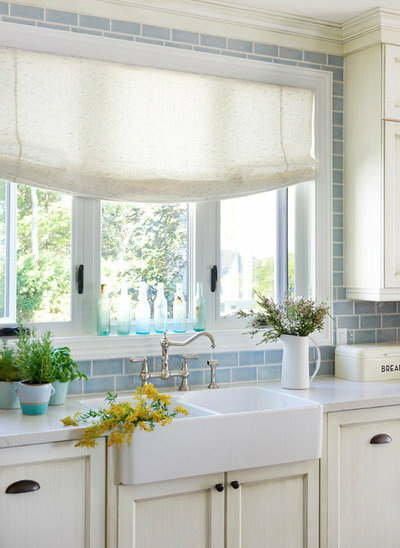 Update a lakeside cottage kitchen and give it a “comfortable, breezy and beachy vibe,” designer Emily Griffin says. Other special features. Serving area and breakfast bar with reclaimed-wood open shelves. Industrial pendants. Two dishwashers. Designer secret. “A huge win was putting in the big window over the sink to let in more light,” Griffin says. Homeowner’s request. A large island for dining, gathering and prepping food. Dining setup. The large island seats six comfortably and is topped with Eternal Statuario quartz that mimics Calacatta marble. 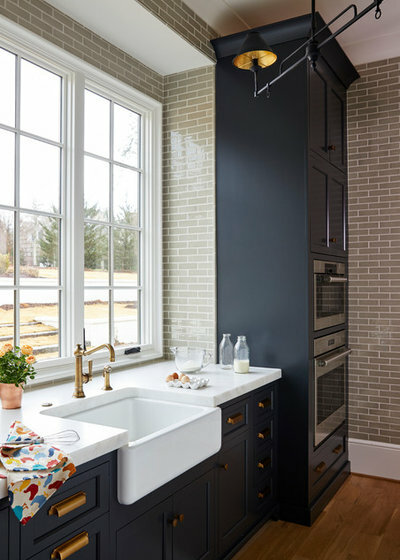 “We wanted the legs of the island to be substantial to balance out the weighted feel of the hood on the opposite side of the kitchen,” designer Jen Harris says. 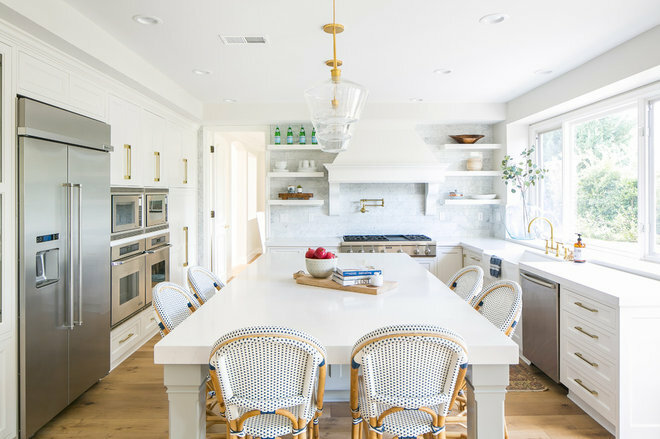 “It also serves to help the island feel more like a piece of dining furniture, rather than a typical kitchen island.” The 1930s-style chairs are meant to “mimic the whimsical chairs of Parisian cafes,” she adds. 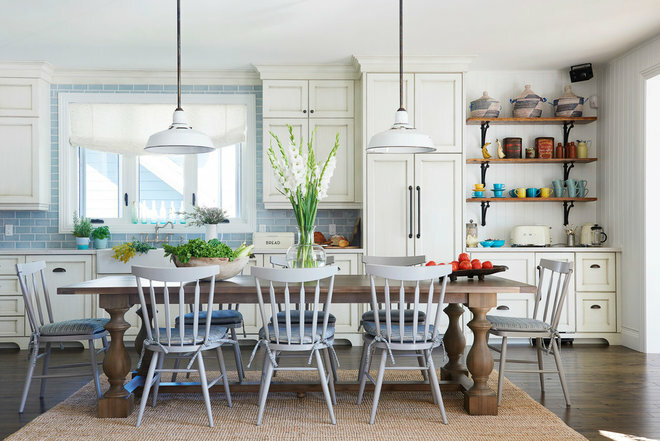 The slightly darker gray island cabinetry and legs help set the island apart from the white cabinetry and gray walls, and further emphasize the island as a stand-alone piece of dining furniture. Other special features. Marble tile backsplash. Oversize hood. Homeowners’ request. Update the look of the kitchen and dining space while working with the existing cabinetry and Black Marinace granite countertops. Dining setup. Counter-height dark-stained table with woven grass stools. 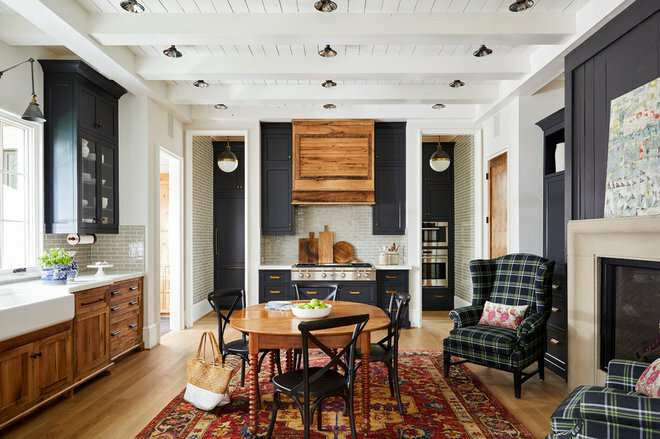 “My client uses the table often as the place to eat and gather with family and friends,” designer Jenny Sutherland says. Other special features. 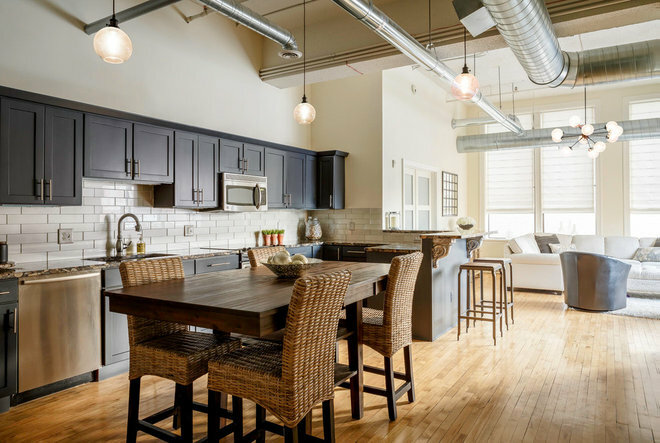 Dark gray cabinets (painted in Cyberspace by Sherwin-Williams). Metallic back-painted-glass subway tile backsplash. Exposed ducting.